At a glance, the use of bamboo in textiles seems like a good idea. Bamboo is a swift growing woody grass that has historically been used as building material due to its light, flexible and durable nature. A stand of bamboo can be clear cutted and in about 5 years grow back to maturity, which has contributed to its perception as a sustainable resource. These positive qualities of bamboo have popularized its usage in fabrics. Bamboo fabrics are therefore advertised as being environmentally friendly due to their sustainability and appearance of using minimal ingredients. However, bamboo fabrics, specifically bamboo rayon, should not be supported because the materials needed within the lifecycle of bamboo rayon degrade the environment and are harmful to human health. The production of bamboo rayon is the most chemically intensive, environmentally polluting and human hazardous step of its life cycle. When bamboo is used as the cellulose to create rayon it must go through a multistep process, each with various chemicals used to refine it into a liquid form that solidifies into thread. The first step of the process uses a substance called caustic soda (aka lye and sodium hydroxide). This chemical is used due to its absorptive properties, it could even absorb water and CO2 from the air. However, lye is also corrosive and if any contact is made with skin, it can cause severe burning and blindness if it reaches the eyes. Another dangerous chemical used is carbon disulfide, which is utilized to break down the bamboo. Chronic carbon disulfide poisoning has been shown to lead to microaneurysm, a symptom in the eyes, that can lead to glomerulosclerosis, which is scarring of the kidneys (8). Chronic exposure has also been shown to damage the human nervous system, disrupt reproductive health, cause liver fat degeneration, hearing loss and more (9). Shockingly, there has been reason to believe that longtime exposure also leads to coronary heart disease, as observed in a study on rayon factory workers (10). This is the main chemical that creates a negative reputation for the production of rayon and rightfully so, the list of negative effects this chemical can cause is extensive. Many ways to reduce human exposure to this chemical in the production process has been proposed, but due to its propensity to get in the air, it’s been difficult to prevent all health concerns. Therefore, if producing rayon chemically continues, the hazard it brings to humans will continue. The materials used in the modes of transporting bamboo rayon products vary, but all are generally fossil fueled and therefore negatively affect the environment and human health. The extraction of crude oil and the refinement of oil into forms usable for transportation is an extensive process that pollutes the environment and raises human health concerns throughout. Crude oil or petroleum can be obtained by pumping high volumes of water, with harmful additives, into the oil deposit, forcing the oil out. This process is called fracking and it has been known to cause groundwater contamination and harm human health due to the toxic additives that are jetted deep underground. ⅕ of the injected water surfaces back up in wells in the first 2 weeks, methane released can pose a risk of accidental ignition and explosion and heavy metals have been recorded to been released into local water sources (11) Some recorded ill effects humans have experienced that have been linked to oil extraction are higher rates of cancer, skin and respiratory disorders (12). Petroleum refinement is also a pollutive process as its common for waste water to be discharged into local waterways and these chemicals have been shown to cause genetic damage to aquatic organisms (13). The waste from oil refineries is different than that from crude oil as it’s more toxic and lasts in the environment longer (14). The location where the waste is deposited is usually devoid of life as direct contact leads to poisoning and exposes life to lethal water soluble content. Once made, there isn’t much environmentally polluting materials that are necessary for its use or reuse, but maintaining the bamboo rayon product can pollute the environment. The main material that is necessary for maintenance, is the laundry detergents used to clean the fabric. Detergents aren’t inherently that toxic even when exposed to skin for long durations of time (15). However, due to the recent popularity of the Tide Pod Challenge the likelihood that detergent will be ingested and cause harm, is a real concern. If consumed, detergent, which is usually composed of ethanol, hydrogen peroxide and polymers can burn away at the throat and inner lining of the esophagus and stomach, inducing vomiting and explosive diarrhea. (16) The toxic chemicals can then transfer to the bloodstream and poison the nervous system, which can lead to death within hours if left untreated. Another way detergents cause harm is by affecting local waterways. When detergents break apart they actually release nitrogen and phosphorus into the water which leads to greatly increased algae growth(aka algal blooms) . Some algae, like blue green algae, can be toxic and even carcinogenic and in general algal blooms are hazardous to the environment because they increase the amount of decomposers in the water, reduce oxygen levels and therefore kill off much marine life (17). There are no additional materials needed to recycle bamboo rayon, unless the way of recycling uses shredded bamboo rayon as cellulose again. Then the materials used will be the same as in the production stage, with the same harmful effects. In regards to waste management, this was an area of research where there doesn’t seem to be much information on. If there was an article on a proper way to dispose of bamboo rayon, then the effects of the materials needed could be researched. To conclude, making bamboo rayon should not be supported due to the hazards it brings to the environment and human health. Many materials needed within the lifecycle of bamboo rayon have been recorded to damage humans and destroy wildlife. It would be unwise to continue the production of bamboo and to continue harming life by doing so. Mack, Richard N.; Smith, Melissa C. Invasive plants as catalysts for the spread of human parasites. NeoBiota . 2011, p13-29. 17p. Toxic Substances Portal - Carbon Disulfide.” Centers for Disease Control and Prevention, Centers for Disease Control and Prevention, 21 Oct. 2014, www.atsdr.cdc.gov/mmg/mmg.asp?id=470&tid=84. Howarth, Robert W., et al. “Natural Gas: Should Fracking Stop?” Nature News, Nature Publishing Group, 14 Sept. 2011, www.nature.com/articles/477271a. Kponee, Kalé Zainab, et al. Environmental Health, BioMed Central, 2015, www.ncbi.nlm.nih.gov/pmc/articles/PMC4636824/. Interlandi, Jeneen. “What Eating a Laundry Pod Can Do to You.” Consumer Reports,www.consumerreports.org/health/what-eating-a-laundry-pod-can-do-to-you/. “EPA.” EPA South Australia, www.epa.sa.gov.au/. As the state of the Earth’s environment continues to decline and manufacturers look for alternatives to necessary resources, materials are discovered that end up being a proper substitution. However, these materials or the processes they are associated with are not always sustainable or good for our environment. One of these alternative materials has been using bamboo for textiles. Bamboo as a material has grown in popularity for use in products that often are made of wood such as cutting boards, flooring, protective cases and outer shells, etc. Public knowledge of bamboo as one of the more sustainable and renewable raw materials make it more appealing to consumers. Manufacturers of rayon have taken advantage of this consumer preference by choosing to use bamboo cellulose for their textile production in order to later use the fact in their marketing strategies for the product. Bamboo can actually be used to make three types of textiles, one of them being completely environmentally sound, however the textile made most commonly of the three is bamboo rayon (Karthik, 153). While bamboo rayon is bamboo based, the process by which it is made into rayon harms the environment and the workers who make it. Therefore, though the fact that it is bamboo based may be appealing to the consumer at first, the consumer must remember that the rayon process involves dangerous chemicals no matter what type of cellulose is used for it. At raw materials and acquisition, bamboo rayon begins with harvesting the inner fibers of the bamboo (Waite, 12) which on its own often does not have a negative impact for the environment. In Ethiopia (Rosenberg) and other parts of the world, bamboo is being used as a solution to deforestation because since it is a grass and not a tree it grows a lot faster and does not have to be replanted after being cut for harvesting. It’s growth can be sustained through low amounts of water or by rainfed water and it requires no pesticides or fertilizers (Karthik, 153) (Waite, 11-17). As a result the use of bamboo remains the least problematic step in terms of waste in this process, however manufacturers must make sure they are harvesting properly in order to avoid deforestation of bamboo. For example, in a large Indian capitol, Kerala workers had to rise against the factory in their area because they were destroying the bamboo and eucalyptus resources nearby. As it’s history of being a versatile raw material through history in Asian countries like China and India spreads through popular culture, Waite suggests that we should try to learn more about it so that it remains a renewable and sustainable source for us to use. 1. Leaves and inner fibres are removed from bamboo. 2. Leaves (in some cases) and inner fibres are crushed together to make bamboo cellulose. 3. Bamboo cellulose is soaked in a solution of 18% sodium hydroxide, NaOH, (also known as lye or caustic soda) at 20-25°C for 1-3 hours. 4. Bamboo cellulose and NaOH mixture is pressed to remove grinder, and left to dry for 24 hours. 5. Carbon disulfide, C, is added to the mixture. 7. A diluted solution of NaOH is added to the cellulose sodium xanthogenate, which dissolves it into a viscose solution. 8. The viscose is forced through spinneret nozzles into a large container of a diluted sulfuric acid solution, (that hardens the viscose and reconverts it to cellulose bamboo fibre). 9. The bamboo fibres are spun into yarns (to be woven or knitted). The steps are similar to types or rayon made from cellulose from different sources making it equally negatively impactful as traditional rayon made from cotton cellulose or tree derived cellulose. Though the rayon is still biodegradable, the harsh chemicals used contribute to pollution (Chen, Burns, 253). CS(carbon disulfide), S (sulfuric acid), and NaOH (sodium hydroxide) have proven to often cause severe health issues among those who work in rayon factories. Carbon disulfide is the bulk of the issue and has been associated long exposure leading to hypertension (Chang, 27), exposure leading to an increased risk of atherosclerosis (which is a build-up of fats, cholesterol, and other substances in and on the artery walls according to Google) (Vigliani, 235), increased risk of hand dermatitis from exposure to both carbon disulfide and sulfuric acid (Tzu-Chieh, 551) and even low exposures levels of carbon disulfide can lead to “absent mindedness” and “difficulties in perceptive abilities” (Casitto, 252-263). There are several papers on the possible health issues that the chemicals associated can cause and though the information is readily available, factories continue to expose workers to these unsafe chemicals. 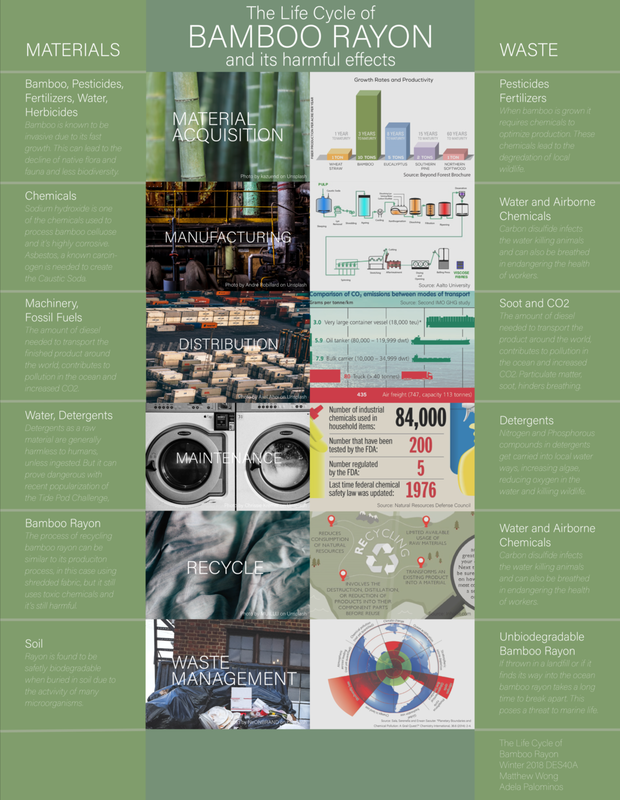 As well as being harmful for the factory workers, the chemicals involved in the rayon making process contribute to environmental issues related to waterborne, airborne, and solid wastes specifically. A factory in the Netherlands (Brunekreef, 439-446) as well as the community described in On Living In The Kal(i)yug both mention the issue of odor and air pollution being an issue in the areas surrounding the factories. According to a study done by Smet, Lens, and Langenhove in 1998, these airborne pollutants often go over the allowed measurements, making the atmosphere around the factory dangerous and toxic (Smet, Lens, Langenhove, 89-117). Waterborne wastes usually consist of the improper disposal of dangerous chemicals into effluent water to large bodies of water surrounding the factories such a lakes and rivers. In Northwestern Italy, the effluent water from a rayon factory destroyed the ecosystem of Lake Orta affecting the wildlife for years to come (Bonacina, 53-59). Overall, chemicals released to the surrounding environment from rayon factories have shown to be very harmful for humans as workers and non-workers, animals and ecosystems nearby, and for the surrounding environment. The wastes associated with distribution and transport of bamboo rayon are quite similar to the distribution of various other products. As with most transportation, there is airborne waste associated with plane transportation and land transportation which most of the time begins in India and China, where many of the world’s bamboo rayon factories are located. There is also waste that comes along with the use of packaging for transportation which can include materials such as cardboard, wood, and plastics. Together, these wastes contribute to global warming and the addition of non biodegradable wastes in landfills. Once the bamboo textile has been purchased by the consumer often in the form of clothes, bed sheets, and other fabric based products, the waste that comes from owning the material can be seen in the form of water used when washing the fabric. Depending on how durable the product is that can be anywhere a couple washes to a several tens of washes resulting variable amounts of water used for washing. Despite the fact that bamboo rayon carries with it such negative environmental impacts during its production, at the waste management stage in the process of its life-cycle it is good to see that bamboo rayon is still completely biodegradable even after the chemical process that it goes through (Waite, 17). This is because it is still largely a cellulose based textile. One study shows that it can even biodegrade faster than it’s much cheaper and less chemically dependent adversary, cotton (Park, Kang, Im, 248-253). However, taking into consideration that we live in a society where global warming and caring for the environment isn’t something that is agreed upon universally, waste isn’t always disposed of properly. As a result, the final textile waste can end up in landfills where it will not be separated and degraded properly, or it could end up randomly disposed of in some part of our natural environment. To conclude, the wastes associated with the production of bamboo rayon are not healthy for the surrounding environments and ecosystems of the factories or for the workers that are exposed to the chemicals everyday. Though bamboo is becoming a great alternative to other cellulose based raw materials, the chemical process that bamboo rayon goes through completely throws out the idea of bamboo rayon being considered a product that is considerate of the environment in its current state. Therefore, it is important for the consumer to be aware of the processes involved in the making of the products they’re buying so as to not be misled by advertising. Bonacina, Carla. “Lake Orta: the Undermining of an Ecosystem.” Journal of Limnology,vol. 60, no. 1, 2001, doi:10.4081/jlimnol.2001.53. Brunekreef, Bert, and Hendrik Harssema. “Viscose Odors in Ambient Air.” Water, Air, and Soil Pollution,vol. 13, no. 4, 1980, pp. 439–446., doi:10.1007/bf02191844. Cassitto, M.g., et al. “Carbon Disulfide and the Central Nervous System: A 15-Year Neurobehavioral Surveillance of an Exposed Population.” Environmental Research,vol. 63, no. 2, 1993, pp. 252–263., doi:10.1006/enrs.1993.1145. Clothing and Textiles Research Journal,vol. 24, no. 3, 2006, pp. 248–261., doi:10.1177/0887302x06293065. Chou, Tzu-Chieh, et al. “Combined Exposure to Carbon Disulfide and Sulfuric Acid Simultaneously Increases the Risk of Hand Dermatitis in Rayon Industry.” Journal of Exposure Science & Environmental Epidemiology,vol. 14, no. 7, 2004, pp. 551–557., doi:10.1038/sj.jea.7500385. Karthik, T., and D. Gopalakrishnan. “Environmental Analysis of Textile Value Chain: An Overview.” Textile Science and Clothing Technology Roadmap to Sustainable Textiles and Clothing,2014, pp. 153–188., doi:10.1007/978-981-287-110-7_6. Mohan, K. T. Ram, Raman, K. Ravi. “Kerala Worker Rises against Indian Big Capital: Report on Rayons Workers' Struggle.” Economic and Political Weekly, vol. 23, no. 27, 1988, pp. 1359–1364. Park, Chung Hee, et al. “Biodegradability of Cellulose Fabrics.” Journal of Applied Polymer Science,vol. 94, no. 1, 2004, pp. 248–253., doi:10.1002/app.20879. Pinney, Christopher. “On Living in the Kal(i)Yug: Notes from Nagda, Madhya Pradesh.”Contributions to Indian Sociology,vol. 33, no. 1-2, 1999, pp. 77–106., doi:10.1177/006996679903300106. Rosenberg, Tina. “In Africa's Vanishing Forests, the Benefits of Bamboo.” The New York Times, The New York Times, 13 Mar. 2012, opinionator.blogs.nytimes.com/2012/03/13/in-africas-vanishing-forests-the-benefits-of-b amboo/. Smet, E., et al. “Treatment of Waste Gases Contaminated with Odorous Sulfur Compounds.”Critical Reviews in Environmental Science and Technology,vol. 28, no. 1, 1998, pp. 89–117., doi:10.1080/10643389891254179. Vigliani, E. C. “Carbon Disulphide Poisoning in Viscose Rayon Factories.” Occupational and Environmental Medicine,vol. 11, no. 4, 1954, pp. 235–244., doi:10.1136/oem.11.4.235. Waite, Marilyn. “Sustainable Textiles: the Role of Bamboo an a Comparison of Bamboo Textile Properties.” Journal of Textile and Apparel, Technology and Management,vol. 6, no. 2, 2009, pp. 1–21.